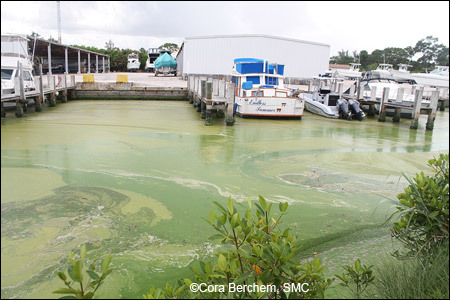 The blue-green algae infesting the waters at a marina in Stuart, Florida. 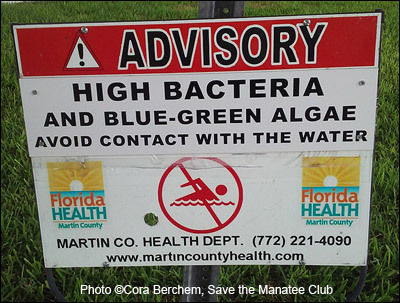 Save the Manatee Club has received many calls, comments and questions in regard to the algae blooms in Florida. We encourage you to share your stories and your photographs with your online network of contacts and with your elected officials at the local, state, and federal levels (see contact information below). Please ask for their help in healing our waters. Save the Manatee Club (SMC) has a long and continuing history of working with the State of Florida to develop stronger Basin Management Action Plans (BMAPs), which are “blueprints” for restoring impaired waters by reducing pollutant loadings. We advocate for more conservative Minimum Flows and Levels (MFLs), which help protect water resources from significant harm from water withdrawals, as well as waterway restoration plans. SMC is also working for stronger protections for manatees and their aquatic habitat throughout the state of Florida and on federal clean water and endangered species protections, including a history of legal actions that have won stronger protections when responsible agencies fail to act in accordance with the law. We actively participate as a charter member of the Manatee Rescue and Rehabilitation Partnership, which includes both Florida Fish and Wildlife Conservation Commission and the U.S. Fish and Wildlife Service, the agencies responsible for manatee rescue and recovery. SMC aggressively promotes efforts to report sick and injured manatees and provides funding and staffing assistance for manatee rescues and releases, as well as funds for the care and rehabilitation of injured, sick, and cold-stressed manatees. Protecting our environment is a marathon, not a sprint, and requires not just reacting to bad situations but working proactively to prevent them. If you are not already working with local nonprofit groups in your area to address these issues, please get involved. Clean water and a healthy environment is not just an environmental matter. Dirty water is a threat to health; to our economy; and to the quality of life for humans and other species. We know that there can seem to be too few hours in the day to volunteer and take action, but we are at a critical time in our state’s history. We need Floridians from every corner of the state and every walk of life to send a clear message that we demand clean water. Please take a few minutes to send messages to your elected leaders and sign the petitions below. Most importantly, stay engaged, even when the blooms disappear. We have a long road ahead of us to truly protect our waters and we need your voice to help us get there. Report distressed, sick, injured or dead manatees at 1-888-404-FWCC (3922) or send a text message or email to Tip@MyFWC.com. You can also use VHF Channel 16 on your marine radio or download the free FWC Reporter app on your smartphone or tablet. Sign the Now or Neverglades Declaration. Click the following links to watch this short video from the Everglades Trust and urge Governor Ron DeSantis and Agriculture Commissioner Nikki Fried to stop the toxic discharges to the coasts and send more clean water south to the Everglades. Ask that they support stronger nutrient restoration plans for ALL Florida waterways. Sign the Floridian’s Clean Water Declaration: wewantcleanwater.com. Write to your elected officials and voice your concerns. Enter your address online to find your state and U.S. congressional representative as well as your state and U.S. senators. Share your videos and photos with them. Write a letter to the editor of your local newspaper and share your thoughts and concerns. Sign up for Save the Manatee Club’s free Action Alerts. 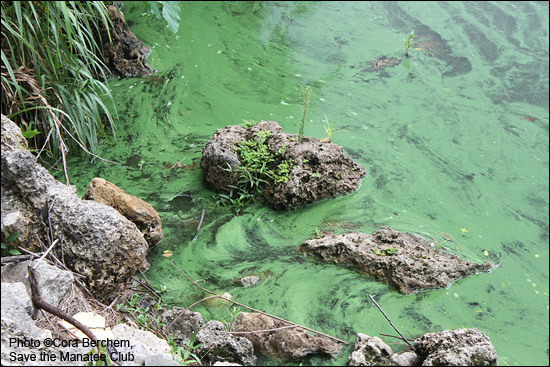 Report algal blooms and get more information from the Florida Dept. of Environmental Protection. Watch a short video featuring Dr. Katie Tripp, Save the Manatee Club Director of Science and Conservation, and learn about the current algae blooms in South Florida, their causes, how they may affect manatees and what you can do to help. A closeup view of the algae bloom at the St. Lucie Lock and Dam in Stuart, Florida.